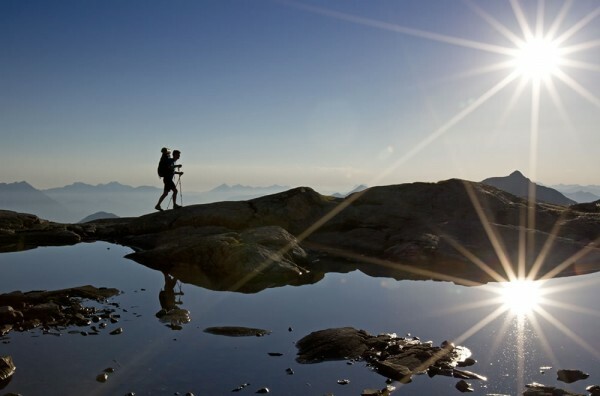 Hiking has a long tradition in Austria and is the country’s unofficial national pastime. There are many villages in the Austrian Alps that really dedicate themselves to hiking or mountaineering. Austria's Hiking Villages are a perfect base for a hiking vacation with easy to difficult day hikes. Austria offers a huge variety of different hiking options and themed walks. 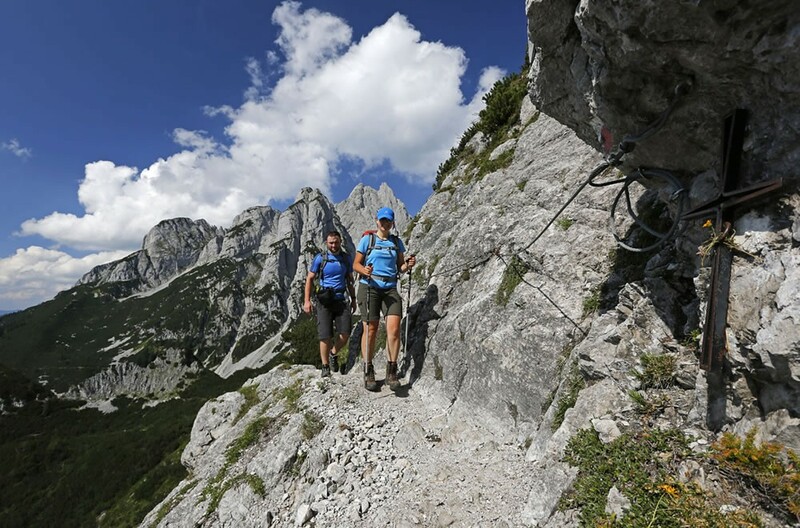 Climbing up one of the countless mountain peaks, hiking from pasture to pasture, following a long distance hiking trail or just enjoying a leisurely day hike - all of this is part of the Austrian hiking experience! It is an AWESOME PLACE. Four star comfort , 40 rooms, new rooms, excellent cuisine, modern spa facilities and the warm hospitality of our team make a holiday at the Posthotel Schladming so special.. The hotel in the centre of Schladming consists of the traditional Hotel Post, the Styrian Restaurant "Johann" and the bar "Cabalou", right on the main square of Schladming. Each room has a shower, bath and a separate Wc, they are spacious and have a phone and a TV, The below description is for a twin room. There are two lounges a bar and a large dining area. Breakfast is self-service with a wide range of Breads, Cheeses, Hams, Yogurt choices, Seeds, Nuts, six kinds of Cereals, excellent fruit and more. There will be a cooked option, mainly scrambled egg and ham and of course the inevitable sausages. Dinner is pre order from a choice of three starters/mains and sweets – including vegetarian option for mains. There is an extensive salad bar which is excellent. Dinner is served to you. On one evening it is likely that there will be a hot buffet and if the wether is good we have a brbeque outside on one night. Unfortunately, for sole use of a twin room, there is a supplement of £16 per night. Our policy is to enable you to fly from your local airport, wherever possible. However flights into Saltzburg from Edinburgh/Manchester/Birmingham/Bristol do require 1 change at an European airport. Flights to Saltzburg direct go from London Heathrow. Saltzburg airport is approximately one hour from Schadlming When you wish to book a holiday with us, we research all the available flights, Charter and “No Frills” airlines from the airport of your choice, we will give you an individual quotation. Dependent on the time of year, specific dates, and air seat prices relevant at the time of booking, then there may be flight supplements. Our partners in Secret Hills Walking Holidays in Europe, New Experience Holidays will provide the individual quotation. They provide us with ATOL bonding. The advantages in cost and convenience however far outweigh any additional local airport supplement- and to support the environment - reducing the overall carbon footprint is good policy. We will meet you at Saltzburg airport for onward transfer to Hotel Post . Dependent on the numbers on the holiday and the times of your flight- rail transfers may be used to transfer you from the airport at Salzburg to the hotel in Schadlming- the station is 300 metres from the hotel. Return transfer is included in the holiday price as well. It may be cost effective for you to fly to Innsbruck, as there are many flights from most UK airports - but the transfer time is longer, though the overall cost of the flight plus transfer may be acceptable, particularly if a number of clients are flying into Innsbruck. THIS IS AN ESCORTED HOLIDAY WITH A UK TOUR GUIDE SUPPORTING THE LOCAL GUIDES. Walking in Austria's, marvellous alpine hill walking , with stunning vistas of lakes and river valleys. 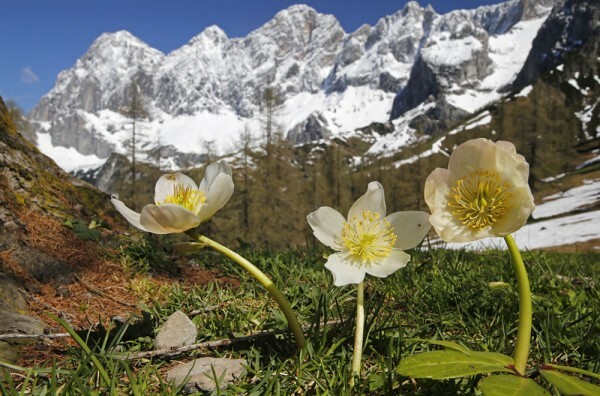 There are alpine meadows to amble through, and fast flowing rivers.with many waterfalls. Simply stunning alpine mountain scenery walks take us over stunning ridges, and down beautiful valleys, There are larger peaks to conquer as well, but we use Ski and Chair lifts and mini buses to get us to within striking distance of bigger summits, the last few hunderd metres can be steep, but the views are worth the effort, and there is a variety of scenery for the discerning walker. We grade the walks as moderate with some short strenuous stretches. An easier shorter option is available on each day. Five days walking during the week’s break, with one day as a rest day. Walking is moderate, we don’t rush the hills and ridges - talking, looking, learning about Austria- tends to slow the pace a little. After a mini bus journey to the walk start, we walk for about five and a half hours, returning at about 4.30 pm - Time for a swim, or simply rest before dinner in the hotel’s dining room. Underfoot conditions are good, with some loose stones, and many tree roots on some paths. Green path walking is frequent. Climbing is steady, with the occasional steep short stretch, not to be rushed, and downhills are … well downhills - always a pull on the old knees. Distances are 7 - 9 miles a day. There is always a cooling breeze so early mornings require a top layer, but after that, it is shorts and tee shirt walking. . The average temperature in July is between 18 and 22 degrees but don’t forget we are in a mountainous area, so early mornings will be chilly. At night, expect the temperatures to go down to about 8-12 degrees .Some days may be warm, remember we are in high mountains at 2000 metres high, so you will need warm weather clothing early in the morning. It will almost certainly be very misty in the early mornings, but that is not an indication of what the days weather will be. The 64,000 dollar question is – Will it rain? Probably, and maybe around four o’ clock, it can have a good shower. Our guides carry umbrellas in their rucksacks – they say it takes 90% of the rain and protects their clothes – we cannot fault their logic and will be doing the same. One thing you will need is sun cream and after sun – at 2000 metres it may feel cool -the sun is very strong. Although our leaders are well trained and experienced in dealing with different capabilities of our walking clients, if they have any concerns about any clients ability or suitability to undertake safely any walking activity we plan or they feel that participation of an individual may affect the groups safety and cohesion, then they have full permission to exclude that client from an activity. They will try at all times to provide an alternative suggested activity, though this may involve the client in additional local cost. We rarely have to enforce this above recommendation, but it is a sensible and necessary protection for the individual client, the group and the leaders. - Any drinks you have in the hotel and out on the walks. On each Austria holiday we have two grades of walking.- moderate and easy. On the moderate walks - 7/9miles - we ascend and descend at least once per day - up to 500 metres but generally over an hour and a half. Pace is critical - we dont rush, there's too much to see, but we do stride out where it is possible. Underfoot conditions and paths in Austria are good..
On the easy walks - which may also include some sightseeing of villages. towns, and things of interest generally . There will be hills to ascend/descend but we will take these very steadily - we do not rush our clients.As with the walking grade paths are good.. The pace is slower, not snail pace but enough to give you a good walk, and to allow you to enjoy the wonderful Austrian countryside. Each day you have the choice of either walk. Secret Hills Walking Holidays organise all aspects of your holiday– including guiding, transport to walks start and provide you with an experienced tour guide.You make your won arrangements to get to the airport in the UK, we meet you at the airport you are flying to, and help you with your transfer to the appointed hotel. 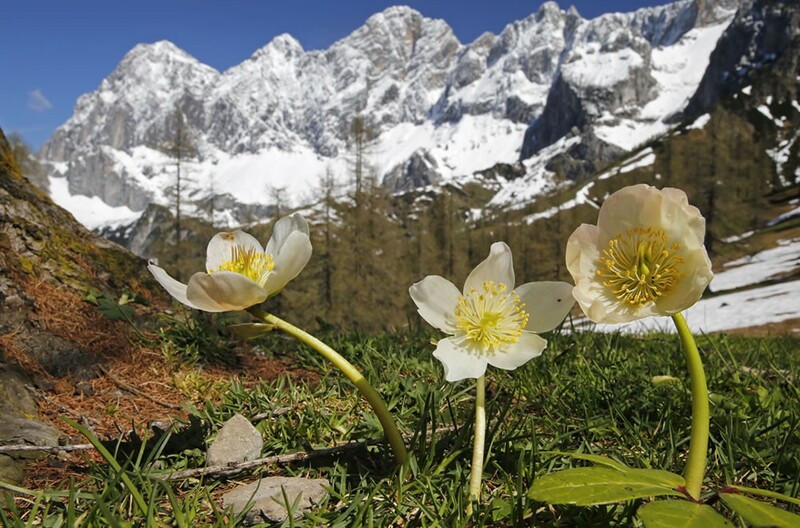 Whether you prefer gentler nature experiences or you are drawn by the high peaks - as you explore the hiking paths of the Schladming-Dachstein region, you are certain to discover one destined to become your all-time personal favourite. Schladming is a small former mining town in the northwest of the Austrian state of Styria that is now a popular tourist destination. It has become a large winter sports resort and has held various skiing competitions, including most notably the FIS Alpine World Ski Championships 2013. It is surrounded by super mountains with the Dachstien peak looming over the northern side of the city at 2900 metres. The shopping area has many cafes, bars, restaurants and a variety of shops that cater to tourists. Shops include wide range of sports gear shops, ladies clothes shops. Unfortunately, for sole use of a twin room, there is a supplement of £7 per night. The magnificent city of Salzburg - just one hour away and easy to get to by bus and train. It's a must for your day off - there is so much to see and do. The joke 'If it's baroque, don't fix it' is a perfect maxim for Salzburg: the storybook Old Town burrowed below steep hills looks much as it did when Mozart lived here 250 years ago. Standing beside the fast-flowing Salzach River, your gaze is raised inch by inch to graceful domes and spires, the formidable clifftop fortress and the mountains beyond. It's a backdrop that did the lordly prince-archbishops and Maria proud. Beyond Salzburg’s two biggest money-spinners – Mozart and The Sound of Music – hides a city with a burgeoning arts scene, wonderful food, manicured parks, quiet side streets where classical music wafts from open windows, and concert halls that uphold musical tradition 365 days a year. Everywhere you go, the scenery, the skyline, the music and the history send your spirits soaring higher than Julie Andrews' octave-leaping vocals. Art, culture and a unique history: Since 1997, Salzburg has been a proud member of the UNESCO World Heritage List – a city of “outstanding value to humanity”. We invite you to experience it for yourself, as you pay a visit to the historical district of downtown Salzburg! The Schladming-Dachstein Summer Card is free of charge for Secret Hills Walking clients and thus enjoy free or discounted admission to over a hundred attractions and activities in the region. The card entitles you also to free transport on cable cars, ski lifts and the local bus ytransport within the region. Thanks for a great week it was a lovely break in some beautiful varied scenery.